The Regenerative Medicine Institute Concludes 2018 with their "Clinical Staff Program" and "Hands-On Stem Cell and Adipose Procedures and Aspirations Training"
RMTI ends training year with their Clinical Staff Program – dedicated to the Physician's team and Hand-On OrthobiologicsTraining – with focus on Adipose and Stem Cell Procedures and Aspiration's. The Regenerative Medicine Training Institute is a unique hands on training that is unmatched! Clinical Training for Regenerative Medicine Procedures dedicated to “YOU” the staff NP, PA’s, RN’s, LPN’s, MA's and Administrative staff. This full day course is an interactive day with lectures, demonstrations, and hands on processing of all the biologics. 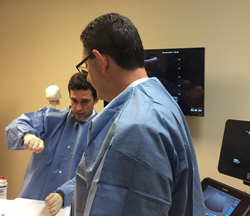 The course will expose your staff to regenerative medicine procedures and processing techniques, and facility providing them with skills that will be an asset to the practice and patients. Educate your team to be a step above the rest! Joseph Purita, MD., A Board-certified Orthopedic Surgeon, and a pioneer in the use of Stem Cell and PRP therapy for orthopedic conditions. Dr. Purita has lectured internationally on five continents regarding the healing effects of stem cells and has been instrumental in helping some countries design their policies concerning the use of regenerative medicine; effectively bringing this unique and advance practice to more practice throughout the world. Dr. Purita’s passion lies in teaching and advancing regenerative medicine techniques and procedures that improve patients’ lives. Paul D. Tortland D.O., - Dr. Tortland is the founder and Medical Director of the New England Stem Cell Institute and of Valley Sports Physicians & Orthopedic Medicine, both located in the Hartford, CT region. He specializes in sports medicine, non-surgical orthopedics, and regenerative medicine. Dr. Tortland was literally the first person in the world to become certified in Regenerative Medicine by the American Academy and Board of Regenerative Medicine, also scoring the highest on the certifying exam. He was also the first person in New England to begin performing both PRP and stem cell injections in 2007 and 2008, respectively. Also, he has been doing Prolotherapy for over 23 years.